Well today was eventful! We took the Coaster Old Town Dan Siego, toured around a little bit and then bought tickets to the old town trolley tour. It's one of those 'hop-on-hop-off' tours that takes you around the city's top attractions. Brian and I have done it a handful of times as its one of his favorites. In fact we often joke about how he's going to be a trolley tour driver when he retires. He's got some cheesy jokes and historical trivia all ready to go! The first stop after Old Town was the Maritime Museum by the harbor. As often as we come to So Cal we'd never been through this museum before so we decided to try it out. It basically consists of seven ships/submarines/ferries each with unique histories. Our favorite was the Russian sub but they were all pretty cool. Then we ate lunch at San Diego's oldest seafood restaurant on the harbor. This may have been the turning point for the rest of the day. Making our way back to the trolley stop took some time, as did driving around the rest of the stops to let people on and off until we finally got back to Old Town. This morning we had planned on eating dinner at one of the yummy Mexican restaurants there, but considering the circumstances we just kept moving, only pausing for Clara to be sick again. After all, we still had to take the Coaster back to Oceanside, which was a 55 minute ride. And by now Chase was feeling ill too. Luckily we spotted a trash can as we boarded the train and he ended up having to use it just minutes into the ride. Yup, that was pretty much our day. Now the plan is to keep them isolated from the cousins, just in case it wasn't the lunch that made them sick. Tomorrow is our last full day in Oceanside and we were planning on snorkeling in la Jolla cove. We'll have to see how we're doing in the morning. PS - Turns out Grandpa was up sick last night, and two other cousins have gotten sick today too, so apparently it's wasn't our lunch. The Star of India ship, built in 1863, is trying to keep up with the times. These guys freaked us out as we walked around a corner and saw them unexpectedly. They're even creepier in real life. The inside of this sub was so cool! 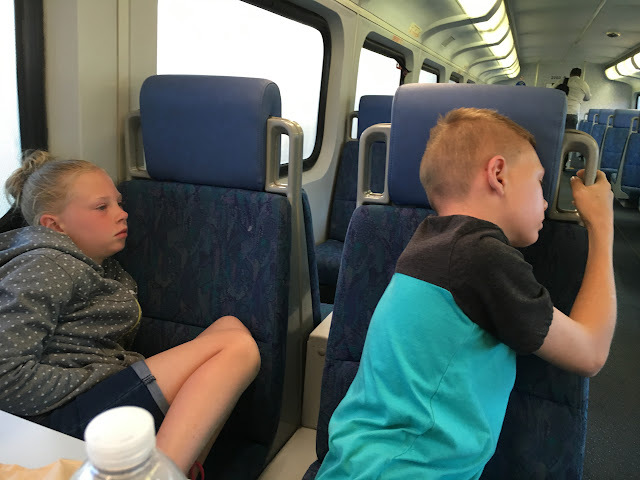 On the train ride home... poor kids!